The energetic, a cappella debut offering from Epic, 2012 international quartet champions of Harmony, Inc. Featuring a broad range of contemporary a cappella and traditional, gorgeous barbershop harmonies, the album more than lives up to its name. Epic formed when two barbershop acapella harmony singers, a jazz singer and an opera singer found they discovered a common love of ringing chords, fun rehearsals and fantastic shoes. The foursome hails from Virginia and Maryland and is proudly affiliated with Harmony, Inc., a premier international organization of women barbershop harmony singers. 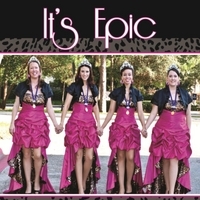 Epic was crowned the 2012 Harmony Queens at Harmony, Inc.’s international competition and convention in Orlando, Fla. The quartet’s popular rendition of “Cruella DeVil” helped them overcome a missed plane (she eventually made it), a case of food poisoning (the ambulance ride helped) and being ranked third in the contest before the final round of competition in order to win the title of International Quartet Champions. Christina and Kristina (yes, fun during rehearsals) are “barberbrats,” having grown up the daughters of fathers who are notable barbershop harmony singers. They connected with Shana, an opera singer, and Anne, a jazz singer—both of whom were new to the barbershop style but have proved to be naturals at the musical art form. In addition to their crowns, the quartet won Harmony, Inc.’s Area 2 quartet competition and also placed second at the 2012 Mid-Atlantic Harmony Sweepstakes a cappella competition and The A Cappella Sing-Off competition held in Williamsburg, Va.